A few weeks ago, I bought a bundle of Alison Glass' Handcrafted Indigo fabric. At the time that I bought it, I thought that I had a plan for the fabrics but the minute that I had the fabrics in my hand, I knew that I had to have a rethink. 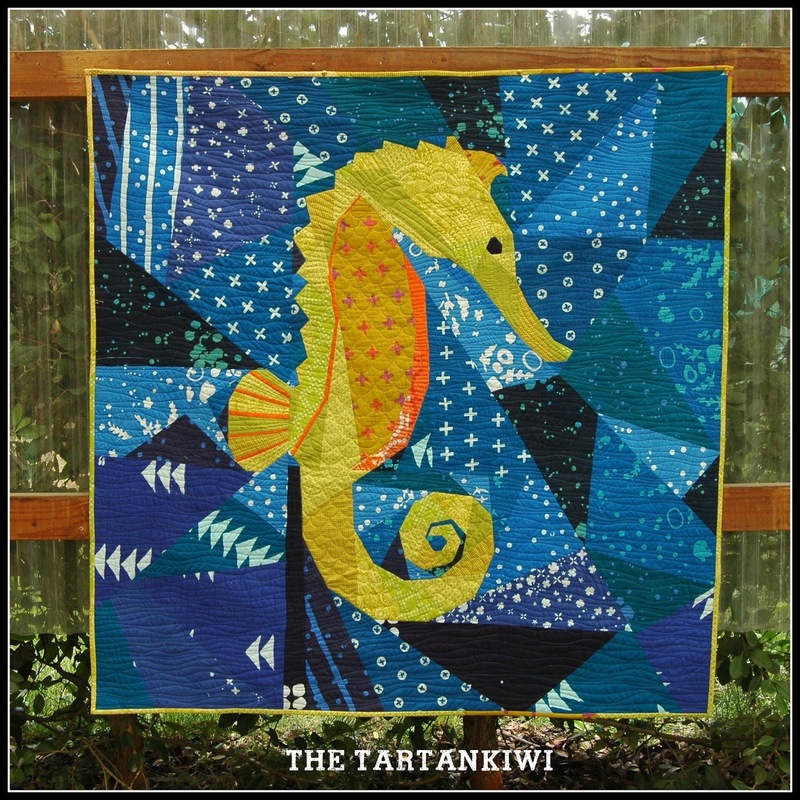 The rich blue tones just cried out to be used as the sea and I immediately hatched a plan for a seahorse quilt. The minute that the design was finalised, I was impatient to start sewing. I had been sewing a lot of gifts and I wanted to take the pressure off and do something fun! As a result, all the remaining fabrics for the quilt needed to come from my stash. I needed to start immediately. 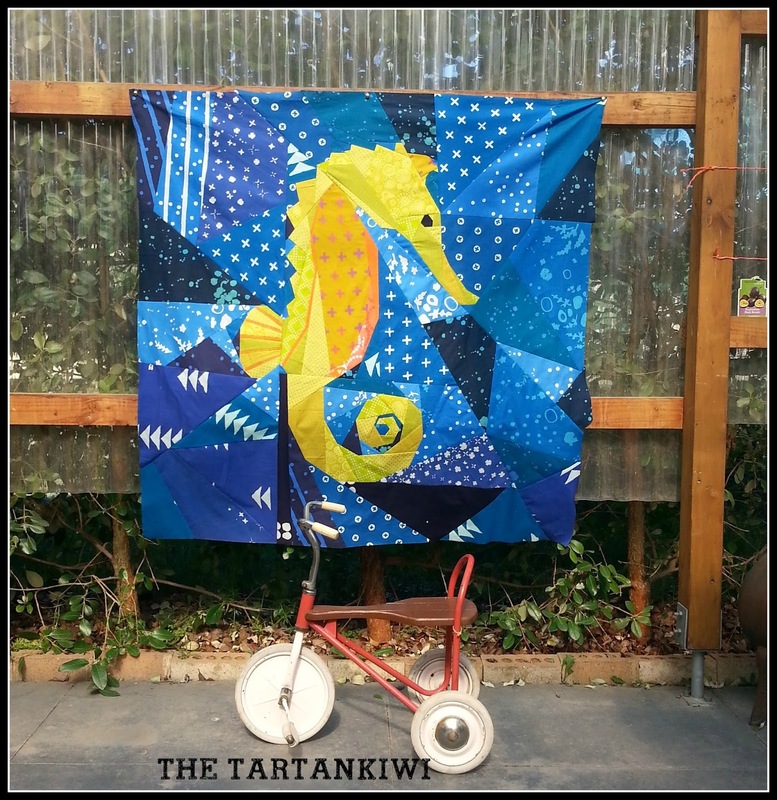 I really wasn't sure what fabric to use for the seahorse.My initial drawings had the seahorse done it one fabric, but that seemed dull and flat. There were too many options and my head began to spin. Then I sat down and thought logically. I wanted to stay true to my own style so I didn't want the seahorse to be faceted multi-colour. I didn't want it to be orange or pink. I wanted realisitic(ish) with a hint of fun. I wanted there to be a stark contrast between the seahorse and the background. With this knowledge, I went to look at my stash. Green, blue and purple were all ruled out as a result of my list of conditions. It occurred to me that I had quite a range of mustard, yellow and lime green tones and that these would work perfectly. A spot of orange for contrast and oakshott cotton for the eye- what could be better!?! It was a totally random decision to make the quilt measure 50 inch on all sides. I guess the zebras had been 40 inch and I wanted to keep challenging myself by increasing the size of my blocks, so 50 inch was a logical choice. I had no idea whether or not I would have enough fabric, but I just went for it. 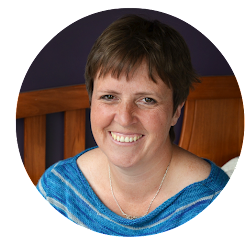 Fearless sewing- that's my thing! Lets say that I cut it fine on the fabric requirements! I had to alter the background as I was sewing to ensure that there was enough fabric to finish. Luckily, that is easy to do when it is your own pattern and you are sewing a fractured background. 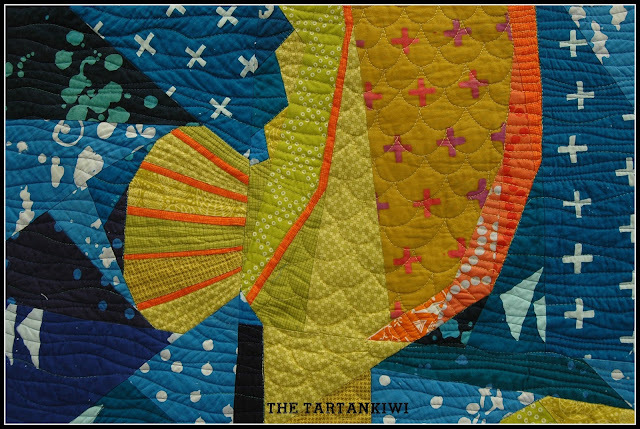 One of the things that I am most proud of on this quilt is the quilting. I can really see the progression in my skills level from Zebra Dazzle to Treasure of the Sea. I have always said that quilting is a journey for me and I love being able to see that I am not stagnating. 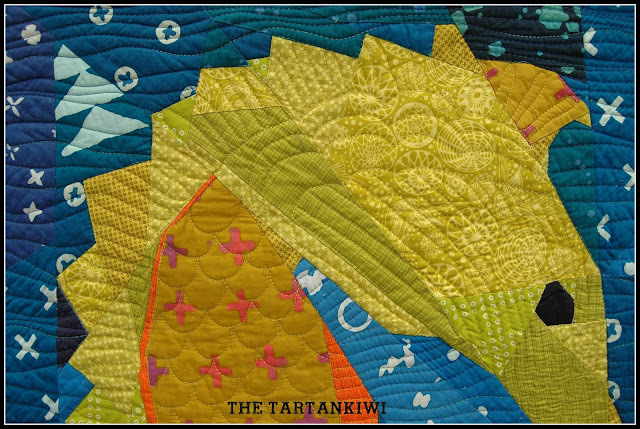 It can be intimidating deciding on ways to quilt things and it can also be tempting to take the easy way out and stick to techniques that you KNOW are within your skills level. I have been challenging myself recently and it is really rewarding to be able to see the improvements. I promise that I will release the pattern, but I don't see that happening any time soon- sorry. I will of course keep you posted with my progress. Stunning, Juliete - both the colours, the design and the quilting. This is fantastic! I love how the water twinkles/sparkles. Your "true style" is awesome! The fractured background in the deep blues sets off your jolly seahorse beautifully. The quilting is marvellous. Clever girl! Great color/fabric choices! Put me down for pattern testing, whenever you get around to it. The seahorse is fantastic! I can see why you had the urge to create it without pause. Fabulous! I love the yellow binding, it really frames your beautiful piece. Just gorgeous! 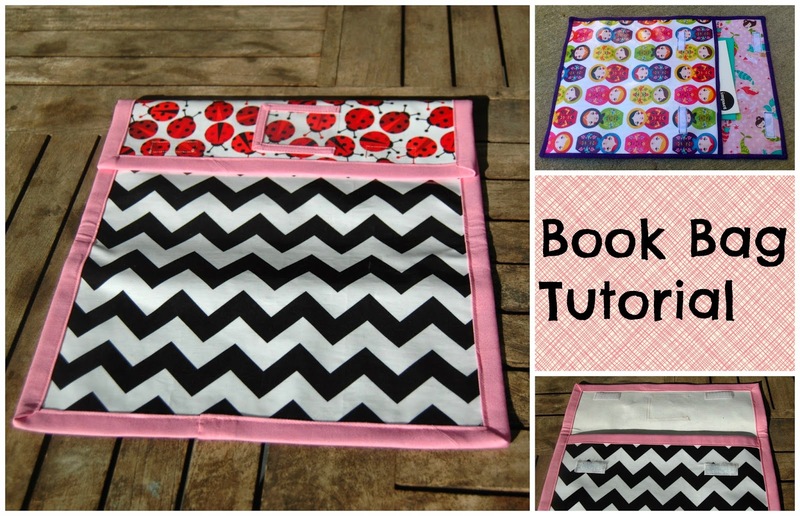 The fabrics, the design, the quilting, all just exactly right! Your seahorse is both realistic AND fun. 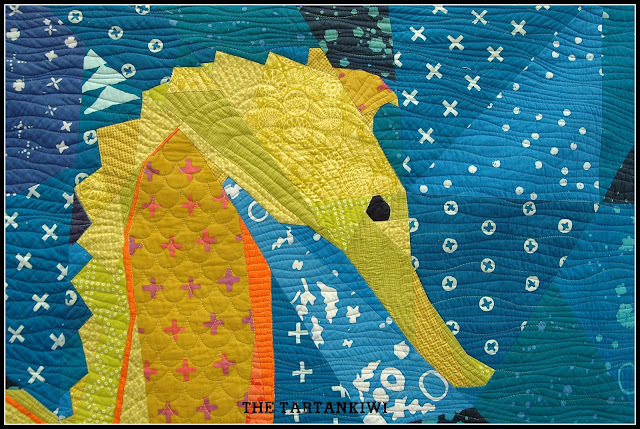 Love the quilting you did, especially the clamshells on the seahorse himself. I look forward to seeing another one of your awesome patterns when you find time to release it. Thank you! Hi, I found your post on Sew Cute Tuesday. You were really were inspired with this quilt. 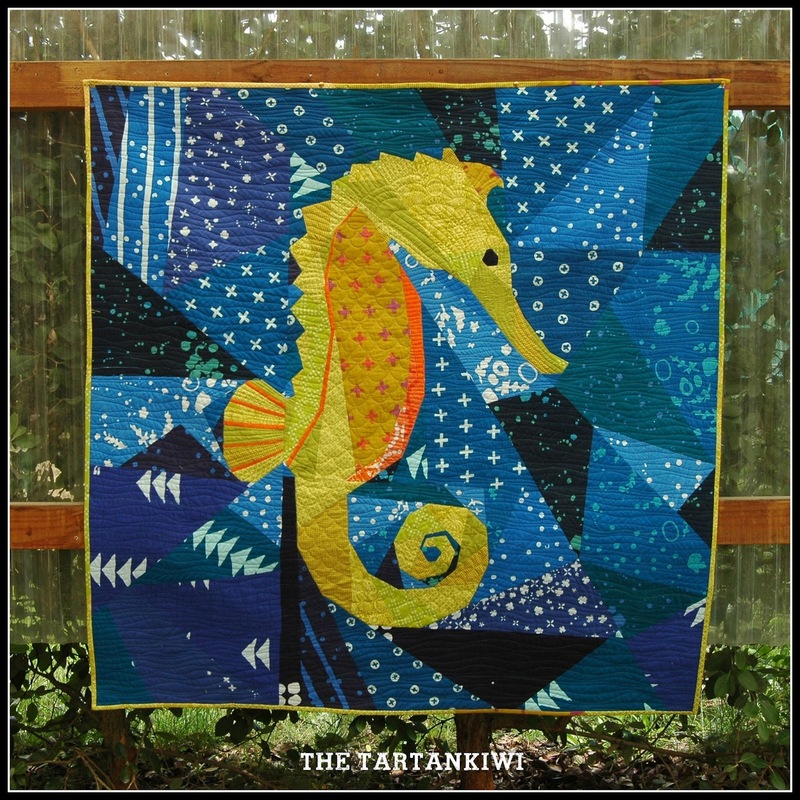 The seahorse is a great design, lovely curves and mix of colors. A terrific use of the blue fabrics. Beautiful, the quilting is spot on perfect. Most eye catching! Nice work.